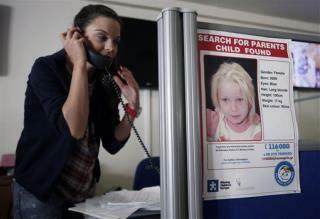 (Newser) – A Roma woman in Bulgaria said today that police have questioned her about whether she is the mother of a girl found living with an unrelated couple in Greece, and that she is willing to do a DNA test and take the child back if she is proved to be hers. The search for the parents of the girl known as "Maria" apparently led to central Bulgaria, where police tracked down 38-year-old Sasha Ruseva in the town of Nikolaevo. Speaking to Bulgarian TV, Ruseva said that she gave birth to a girl while working in Greece "several years ago," but that she had to leave the child because she didn't have enough money to take her home. Next on Newser: From 'Blurred Lines' Star to It Girl? Now that it's been revealed that the child is not white, but rather an albino Roma girl, I hope Westerners won't suddenly lose all interest in her and that Western news outlets won't stop covering the story..
Genetic testing in Bulgaria has confirmed Maria’s parentage. You can see a picture of a brother and sister of Maria here: http://www.elmundo.es/mundo/2013/10/24/5268fd2968434110568b4582.html Maria’s mother, Sasha, may have sold Maria for 250 euros “some years ago.” Maria was born in Greece. Sasha left Maria’s father, who had spent time in prison for assault and robbery and had also received psychiatric care, years ago. Further clarification will follow in news reports. "she had to leave the child because she didn't have enough money to take her home. Ruseva has had eight children. "I intended to go back and take my child home, but meanwhile I gave birth to two more kids so I was not able to go back," Congratulations! Way to go! You are the new spokeswoman for the eugenics movement. Your first paycheck will be in the form of an all-expenses-paid tubal ligation.